Hopes for African tech are high. But who will train the coders? A good coder is hard to find, as Kenyan entrepreneur Tonee Ndungu knows. Nairobi is chock-full of mediocre ones, while those with real skills are in such high demand they work “five jobs at the same time,” says Ndungu, whose startup, Kytabu, aims to bring digital textbooks to African schoolkids. Ndungu searched far and wide, from Kazakhstan to India, and nearly sputtered for lack of talent. Then he learned of Moringa School, a for-profit startup that aims to turn tech-savvy Kenyans into employable programmers and developers, coders and designers in a matter of months. After visiting Moringa’s classrooms this spring, Ngundu offered two students 14-day internships — and hired them almost immediately afterward. The pair are working so quickly, Ngundu says, that he has moved up Kytabu’s launch date by three months. As cities like Nairobi, Lagos and Kigali become major tech investment hubs, the promise of smart new jobs has rightly generated a lot of hope. Picture far-away armies of bright young developers, coders and UX specialists quietly building the infrastructure of the global digital economy while boosting their own prospects. It’s a fine picture, indeed. But an important question remains, and it has become a quandary for entrepreneurs, aspiring techies and governments alike: Who will train the young Africans to fill the jobs? Is This Africa’s Real Silicon Savannah? Is this Africa’s real Silicon Savannah? Even as Kenya, South Africa and Nigeria vie for that mantle and the jobs that come with it, they’ve focused mostly on cities, neglecting the farmland and actual savannahs that lie beyond. Conventional wisdom says the countryside’s lack of infrastructure makes broadband too daunting; titans like Google and Facebook are looking to balloons and drones to solve the rural Internet conundrum. Which is why Mawingu Networks’ solution is so remarkable. Not only does it bring the Internet age to the boonies, and cheaply, but it does so with a technology so old you might not know about it: TV white space. 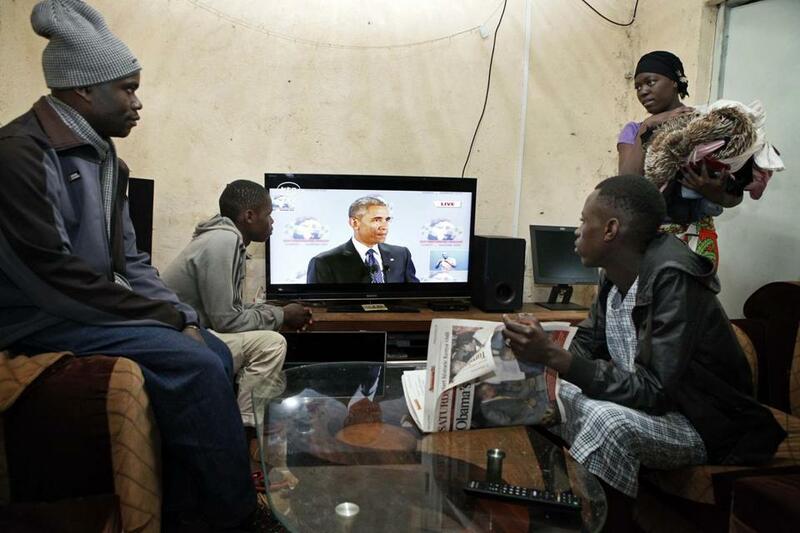 Did Obama Avoid the Difficult Questions in Kenya? In an age of terrorism, many countries — the United States among them — face a difficult balance between security and civil rights. For Kenyan President Uhuru Kenyatta, the fight against al-Shabab is no less than “existential.” But human rights groups here say the way Kenya is fighting terrorists will only cause instability and insecurity in the long run. When Muslims see their peers extorted, or worse, by the police, the natural response is anger. A few may even be drawn into the arms of the terrorists, says Mgandi Kalinga, an investigator with local human rights group Haki Africa. A few is all it takes. And so, “the security situation in Kenya is compromised by the government itself,” Kalinga said. More than any other U.S. president in history, Barack Obama has the chance to shape the course of Kenya’s fight against al-Shabab, not just because of his Kenyan ancestry, but because the United States has helped fund it and train those who are carrying it out. His visit to Kenya over the weekend offered an unprecedented opportunity to influence its parameters. Did Obama dodge the difficult questions? In Nairobi, Social Powered Taxis? In January, the taxi-app juggernaut Uber set up shop on the crowded byways of Kenya’s capital city. But already a bevy of local taxi apps operate in Nairobi. Banking on the universality of its technology, Uber has not taken local taxi culture into account much, unlike its competitors — it insists on giving users the exact same experience anywhere in the world. But the truth is that Nairobi is not Brooklyn, or San Francisco, or Washington, D.C. From culture to infrastructure to labor force, the challenges are different. Read the full story at OZY or at USA Today. The introduction of Apple Pay, which allows users to pay via smartphone, has generated plenty of buzz. But when it comes to mobile money, America trails years — seven years — behind another country: Kenya. The mobile money app M-Pesa launched in 2007 and now has more than 15 million users in Kenya — plus millions more across South Africa, Afghanistan and the rest of the globe. By 2012, the value of M-Pesa transactions reached $18 billion, equal to about 41 percent of Kenya’s GDP. For those interested in emerging markets, M-Pesa has become a larger-than-life success story: It launched a hundred research papers and became a sort of holy grail for other telecom companies, which have tried — largely in vain — to replicate its model around the world. But M-Pesa’s model may finally be spreading. Last month, Kenya’s Equity Bank introduced a new piece of technology that literally piggybacks off of M-Pesa’s success. Called a “thin sim,” the paper-thin chip slips under a standard SIM card used in mobile phones by Safaricom, the telecommunications company that owns M-Pesa. Operating like a second SIM, the device will connect to its own cellular network to allow users to make instant money transfers, just like M-Pesa. Those in the industry are watching closely, not just to see whether another player can finally shake M-Pesa’s dominance, but also because the technology could finally make mobile payments feasible in other developing countries. If so, it could further blur the line between banking and telecom, and potentially offer market access to the hundreds of millions around the world who have a phone but no bank account. Driving Drunk in Nairobi? There’s an App for That. It started out as a nice idea that made a sharp left turn and then took a whole new direction. A 22-year-old Kenyan developer, getting the idea from a class at Strathmore University in Nairobi, wanted to create an app to help drivers avoid bad traffic and accidents. But when he learned that a friend had just been stopped by police at an alcohol Breathalyzer checkpoint, he decided to turn it into an app that would warn drivers about checkpoints — and it took off. Fifty people downloaded it the first day. Three days later, 2,500. Then 5,000. But the fun didn’t last. The police soon took notice, and Brian Osoro says an officer called him to try to persuade him to take the app down. “A friend of mine who’s doing law told me this was obstruction of justice,” he says. “In my conscience, I thought, ‘This is bad.’” He read about a drunk driver — of a bus carrying students — who lost control of the vehicle and crashed. No one died, but “I thought to myself, this could be my cousin, one of my brothers. This could get them killed.” Ultimately he took it down, and today he has a much different and successful app– one that helps, not hinders, justice. For more than two centuries, The Old Farmer’s Almanac seemed to hold the answer to every crop grower’s questions, like when is the best time to plant onions (“as soon as the ground can be worked in the spring”) or harvest potatoes (“after 10 weeks, usually in early July”). Agnes Mwaki prefers to use an app. After the 49-year-old banana farmer in Meru County, Kenya, recently switched to growing onions — a more profitable crop — she needed help determining when to transplant the seedlings and when to harvest. Through a government program that provides her with a smartphone, Mwaki now uses WhatsApp to send a photo of her onions each week to an agronomist. “When I spot a problem, I just take a photo and send it to the agricultural officer, and she describes the drug [I’m] supposed to use and I buy it,” says Mwaki. In recent years a growing group of mobile apps has moved in with access to real-time advice and market intelligence, and the latest of that technology is originating where this kind of data is increasingly vital: Africa. Even the smallest of bribes can stifle an economy when they’re magnified millions of times over. When a police officer gets caught soliciting a bribe, most people would tend to blame the cop. In Kenya, the government is trying a new approach: clamping down on the people whopaythe cop.